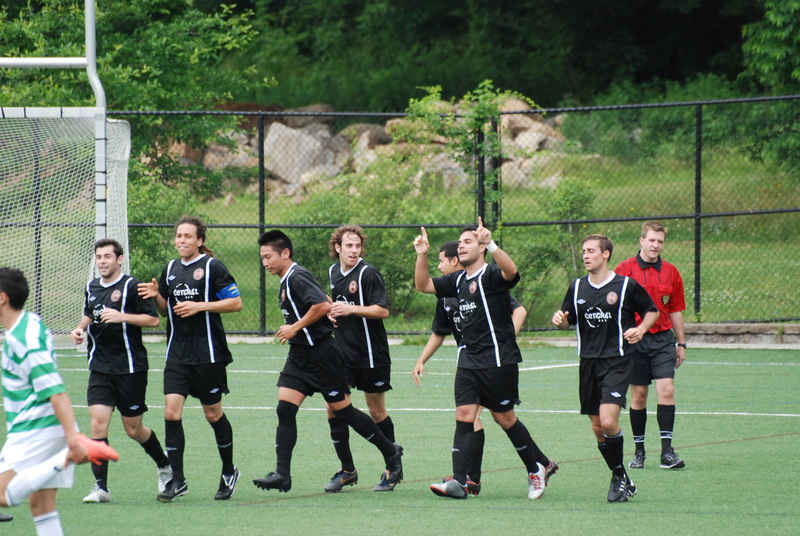 As you may be aware, the Copa is comprised of community based “national teams” and was more recently taken over by the current Cosmos organization. In addition, the Cosmopolitan Soccer League is a major partner of the Cosmos this season and is helping organize and operate the tournament. The schedule can also be found on their site if you want to go check out a game, or just check and see how your fellow CPR players are doing. The White Reserves put an exclamation point on their season with a 2-1 victory in the State Cup final oner Lansdowne on Sunday at Tibbett’s Brook Park in Yonkers. The match was hard fought and very even for the vast majority. Lansdowne came out strong and put some pressure on CPR with a three striker system and persistent long balls coming in. As the match leveled out CPR began to impose their will, holding possession, and moving out of the midfield into the attacking third. There were not many clear cut chances for either side. Towards the end of the half Dan C. caught a Lansdowne defender on the ball, managed to dribble and force his way through a converging Lansdowne back line and from a tough angle rifled the ball past the keeper into the far post. Lansdowne came out energized in the second half with long balls and committed runs. They created a few close chances on corners and long throw ins, but John stood firm and made a number of crucial saves to keep CPR on top. About half way through the referee continued his pattern of shocking decisions by awarding Lansdowne a penalty after Dan Riso took the ball off of a Lansdowne midfielder near the top of the box. They converted to even the match. From here on the game opened up with fatigue setting in for both squads. There was space all over leading to some decent chances and very hard fouls. The referee was loosing his grip on the match with some 2-footed Lansdowne challenges being thrown in here and there. Right as it looked like full time would come at 1-1, CPR was awarder a free kick about 40 yards out on the left flank. 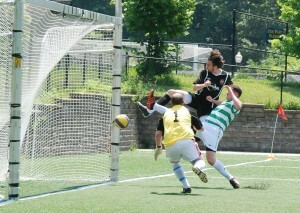 Dan Riso played it down the wing to Andres who floated a ball to the back post. It was met there on a curling run by Matt for the game winner. 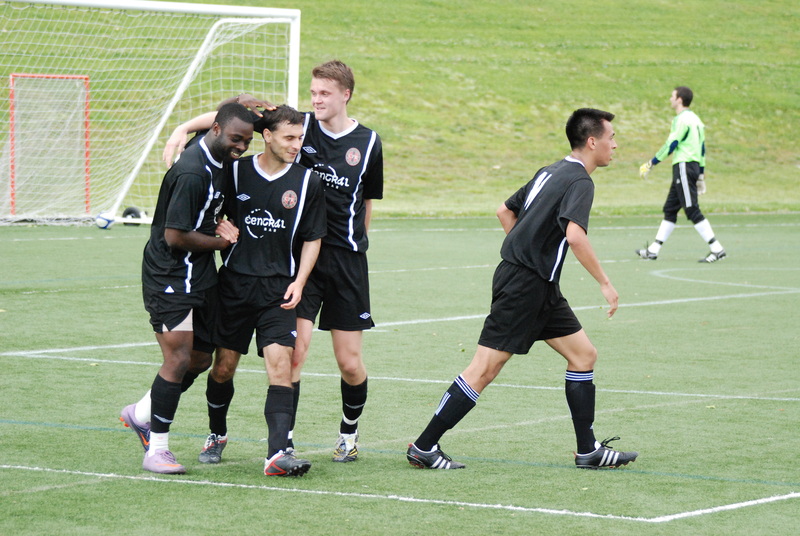 CPR smoothly saw out the final few moments and were crowned D’Arpino State Cup Champions. 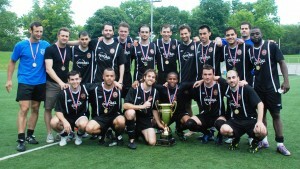 The Clubs first State Cup Title. The White Reserves dominated a hard working yet overmatched Mineola Portuguese side in the Semi-Final of the D’Arpino State Cup a few weeks ago. CPR enjoyed the better of the play in the first half, but Mineola managed to create a few chances off of some dangerous looking long balls. Right before half Lasse latched onto a long ball and managed to slot it past the keeper to bring CPR in at the half up 1-0. CPR came out on fire in the second half looking dangerous every time down the pitch. The second goal came off a corner when Dan C flicked a near post ball from Dan R past the keeper. Chris Brown then decided he felt like scoring. On a driving run from right fullback he laced a shot from distance with the left peg just inside the far post. Browny wasn’t done as he found himself in the penalty area again with the ball at his feet again, and cooly placed it past the helpless Mineola keeper, assist from Riso. Mineola managed to clip one back as they pushed more numbers forward, but never posed a real threat to CPR. Norelli dashed all dreams of a comeback with a brave header after a long throw from Dan C. was nodded on by Matt that found Norelli leaning in for CPR’s fifth goal. Final score 5-1. Congrats go out to the Mens White Reserves who won the D’Arpino State Cup today, 2-1 over Landsdowne, up at Tibbetts Brook Park. We also hope that Dan C. has a speedy recovery from his knee injury he suffered late in the game, he having scored the 1st goal for CPR on the day – he was missed at the post game Riso BBQ! 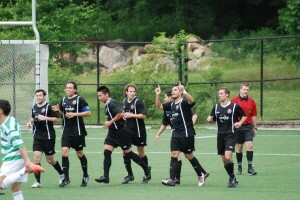 This Sunday, June 10th, CPR Mens White Reserve play Landsdowne in the D’Arpino State Cup Final. Kickoff is 10am at Tibbets Brook Park in Yonkers NY. The Club has yet to win a state cup, so any supporters that can make it and come help cheer on the team would be greatly appreciated. 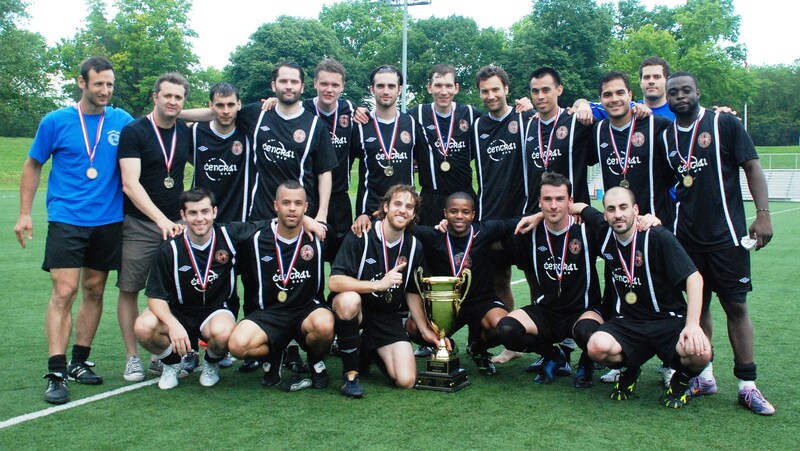 For those that have not yet heard via social media posts, texts, etc, CPR Men’s White (aka the 1sts) beat Hoboken FC 2-1 in the League Cup Final yesterday at Icahn Stadium Soccer Field. 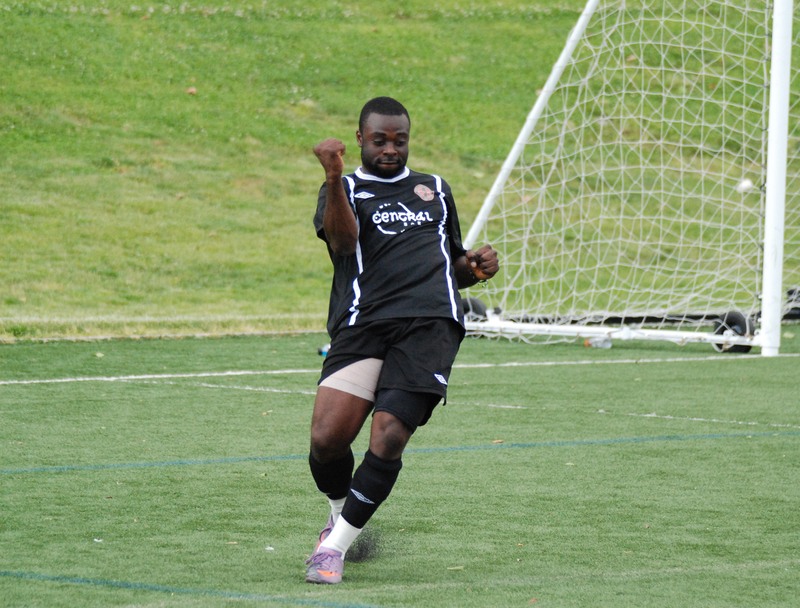 Hoboken jumped out to a 1-0 lead, before CPR came back for the win thanks to a pair of goals from Kwesi, who had been hobbled early with a tight hammy. 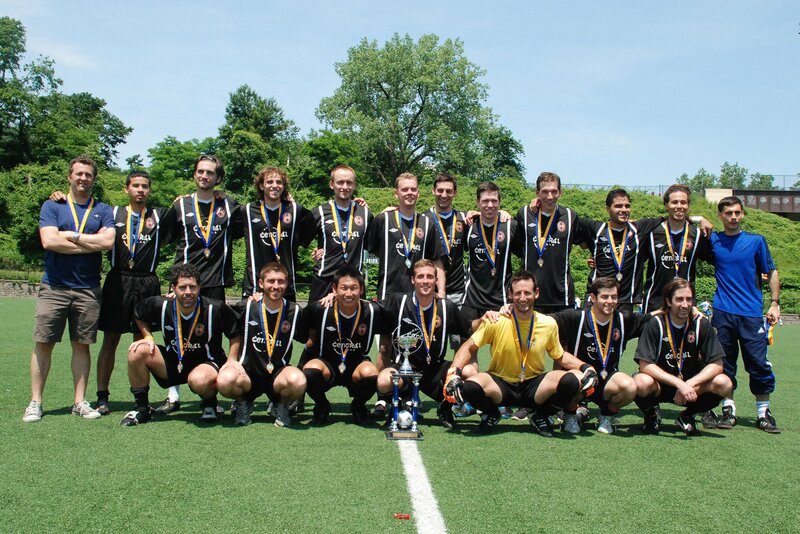 Kudos to all of the players and Yuval for the efforts and for earning some nice silverware.